Poor eating habits, a sudden change in diet, stress and lack of exercise can all influence bowel habits. The traditional recipe of figs, tamarind and rhubarb in Ortisan Fruits & Fibre Cubes contributes to normal intestinal transit. Ortisan Fruits & Fibre Cubes are a delicious, all natural fruity cube for gentle next day action! Chew and swallow one full cube in the evening, with a large glass of water. Figs (Ficus carica L, -7,35g/cube), Wheat Syrup (Gluten Free), Rhubarb (Rheum palmatum L,/Rheum officinale Baill - 496mg/cube), Glycerin, Guar Gum (Cyamopis tetragonolobus (L) Taub - 400mg/cube), Tamarind Pulp (Tamarindus Indica L. - 400mg/cube), Concentrated dates (Pheonix dactylifera L, - 200mg/cube), Fig Flavouring. Do not administer to children aged under 12 years. Do not use without medical advice if pregnant or breastfeeding. Do not use for extended periods of time without medical advice. Do not exceed the recommended daily amount of 1 cube. Preferably store in a dry and dark place at room temperature. This is not a confectionery product, but a food supplement to support regular intestinal transit. The colour, smell and taste may vary but will have no effect on the efficacy, this is due to the natural characteristics of the ingredients. 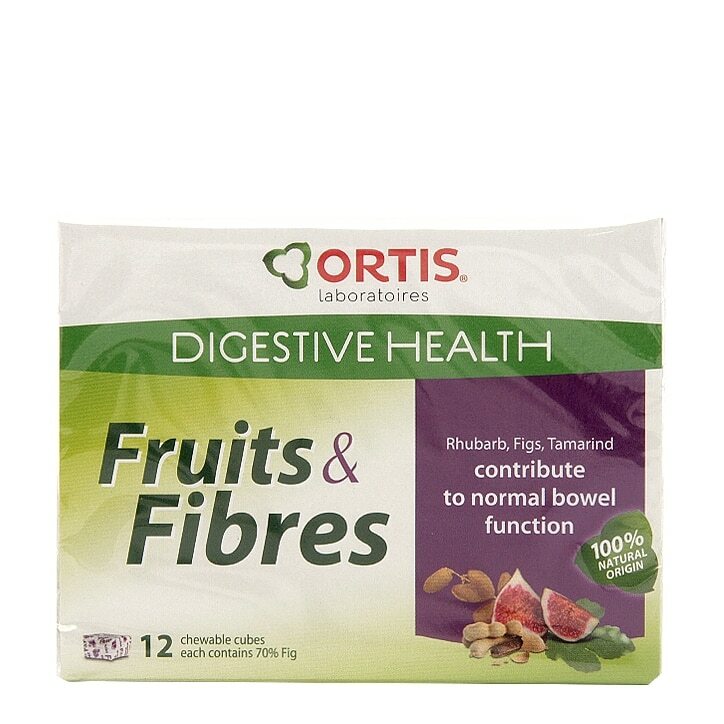 Ortis Fruits & Fibres Chewable Cubes is rated 4.4 out of 5 by 49.